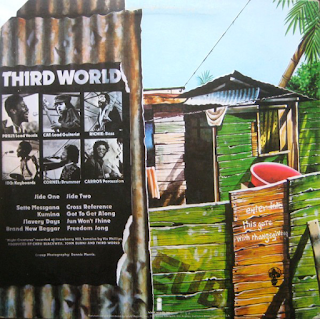 It is a shame that Third World, a mid-late seventies reggae band but one influenced not only by the reggae of their native Jamaica, but also by disco, soul and funk, were often not given the respect or credibility they deserved from reggae "purists". Many such people accused them of "selling Out" both to other types of music and also commercially. as I said, this was a real pity, because they were a excellent band, producing three great albums - this one, 1977's "96º In The Shade" and 1978's "Journey To Addis". They recorded many more after that, but you can't go far wrong with their first three as an example of a genuine reggae fusion band at their very best. Also, the artwork on the covers of these albums is wonderful too. The criticisms are off the mark, particularly on this excellent debut album. Roots reggae is all over it. 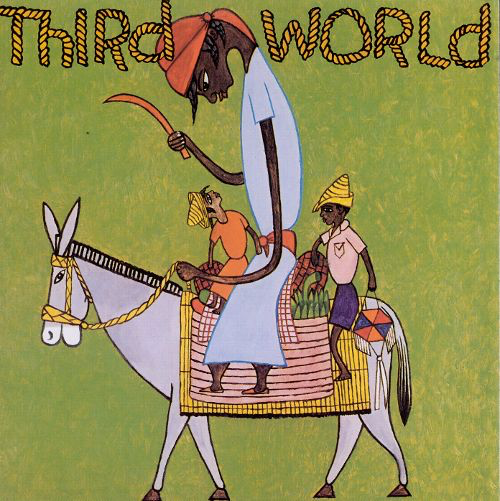 From the rumbling bass and conga potency and roots power of the opener, "Satta Amasa Gana" to the roots consciousness of "Slavery Days", roots ideologies are right at the centre of much of this album. They have taken these tracks, from The Abyssnians and Burning Spear, kept their roots essence but put their own stamp on them and they should be praised for it. "Satta Amasa Gana" has great percussion, wonderful keyboard swirls, intoxicating conga rhythms, skanking guitar and that instantly recognisable light, airy vocal from Milton "Prilly" Hamilton, later replaced by the late Bunny Rugs, who sang in virtually the same style. Great guitar solo at the end too. Just as Bob Marley and Chris Blackwell did on 1973's "Catch A Fire", by using a rock guitar sound, Third World have captured the same vibe, as indeed did mid seventies London band, Cymande. "Kumina" is a brief interlude of tribal/Rastafarian-style drumming before we are led by a throbbing bass and a lilting lead guitar into the cover of Burning Spear's 1975 classic "Slavery Days". 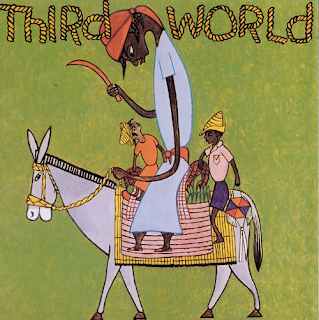 Third World turn it to a seven minute reggae meets jazz meets funk cooking, atmospheric triumph. It has a most unexpected jazzy ending too. "Brand New Beggar" is a pulsating number, with a soulful vocal and backing organ/percussion feel to it. It was these soul stylings that were used so successfully on the band's two huge hits, "Now That We've Found Love" and "You've Got Me Dancing on The Floor". "Cross Reference" is another Rasta-chant interlude, this time with some searing rock guitar licks at the end. Roots, Rock, Reggae, for sure. Then we get a sublime, laid-back, summery reggae/jazz/soul ballad in "Got To Get Along". Beautiful. It could almost be Harold Melvin & The Blue Notes. Again, another stonking piece of guitar at the end. Third World's fusion is always interesting and alluring. It should never be unfairly criticized. Nobody else was really doing full albums of this sort of musical variation within the reggae genre. Some blues harmonica introduces "Sun Won't Shine" and some stabbing, spacey synthesiser sounds before some skanking reggae kicks in. "Freedom Song" has what sounds like a horn solo, but is probably a keyboard, another track where traditional Rasta philosophy is given a musical boost by the integration of other styles. The non-album extra track, the band's first single, "Don't Cry On The Railroad Track" has a conventional reggae backing, but an O'Jay's style soulful vocal. The sound quality on this remaster is excellent. Clear, sharp percussion and warm, thumping bass. Just as it should be.